Live from the 2018 Portland Podcast Festival, it’s time for “Deafula”! 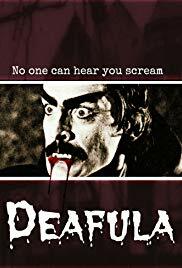 The only movie to ever be made completely in American Sign Language, “Deafula” is an amazing treat. As Brian “The Unipiper” noted: “It’s like ‘Plan 9 From Outer Space’ meets ‘The Room. '” Made in 1975 and only sold on 16mm film (it was a few years too early for VHS), “Deafula” was almost lost to time, and not even available at Portland’s venerable Movie Madness — until now, because we’ve donated our personal copy to them. It truly is an amazing cult classic, and it was filmed in our very own city of Portland. 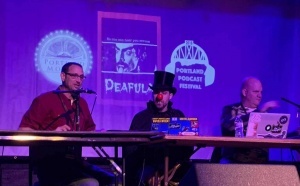 Special thanks to Jason Lamb, Greg Nibler, and Sarah X. Dylan for putting on another great podcast festival, and thanks to everyone who came out!